***FREE SHIPPING*** The "Perfect Fix" for your project. 2 tubes of our checkmate sealant and 50 lf of backer rod. Use this for your maintenance on a larger check/crack. This water resistant check filler forms a tough elastic bond/coat. Even a problem check can be sealed. Shape it, mold it, texture it. This wood filler when used in conjunction with m-balm can certainly bring an unsightly void back to normal. When set e-wood can be sanded, shaped, and stained. **Free Shipping** Check out the more info page. Always use after m-balm on soft, decaying wood. This two component epoxy preps wood that has decay or insect issues. 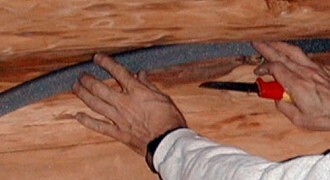 Scrape away the loose, unusable parts of the wood. Apply m-balm to consolidate the soft, spongy, and porous wood. This penetrating liquid will form into a hard water-resistant mass. Now you are ready for wood filler. **Free Shipping** Click for more info on this great product. Look for our "e-wood" as your wood filler choice. S-100 removes most older finishes from your wood siding, logs, decks, etc. This remover does not harm your chinking or other sealants. Very eco-friendly as most every perma-chink product. Will not darken the wood like some finish removers. Water-based. This product may or may not remove some of the high performance stains or topcoats (like perma-chink) with one application. This chinking knife comes bent for that perfect angle.You will not scrape your knuckles with this baby. Place the chinking in the groove, keep a bucket of water handy to keep the knife wet and you're set. Check out our other selection of chinking tools to help do a professional job. ***FREE SHIPPING*** These little babys will spot treat areas prone to decay. Drill a hole and insert, cover with supplied plugs, caulk and seal. The rods release a borate/copper complex into the surrounding area to eliminate active decay/rot spots. Our Backer Rod is an extruded closed-cell polyethylene rod that is used in cracks, checks and gaps before filling them with sealants such as Perma-Chink, Energy Seal, Check Mate 2, etc. Caulk joints should not be more than 3/8” thick and a quality Backer Rod provides a way to fill a deep crevice or gap while maintaining the proper sealant thickness (so you get Maximum Performance). Backer Rod should also be used in checks over 1/4” wide before applying Check Mate 2. 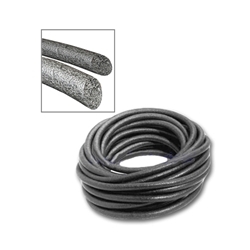 This backer rod is extruded closed-cell polyethylene rod that is used in cracks, checks and gaps before filling them with sealants such as Perma-Chink, Energy Seal, Check Mate 2, etc. Caulk joints should not be more than 3/8” thick and Backer Rod provides a way to fill a deep crevice, check, or gap while maintaining the proper sealant thickness for maximum performance. Backer Rod should also be used in checks over 1/4” wide before applying Check Mate 2.